an ever-changing carpentry wonderland that’s completely kid-built, poised to capture the imagination… What’s been created so far will surely inspire your lil’ builder to add her own touches or modify a current design. In fact, the organic, continually-evolving nature of this park is part of its cool-appeal. 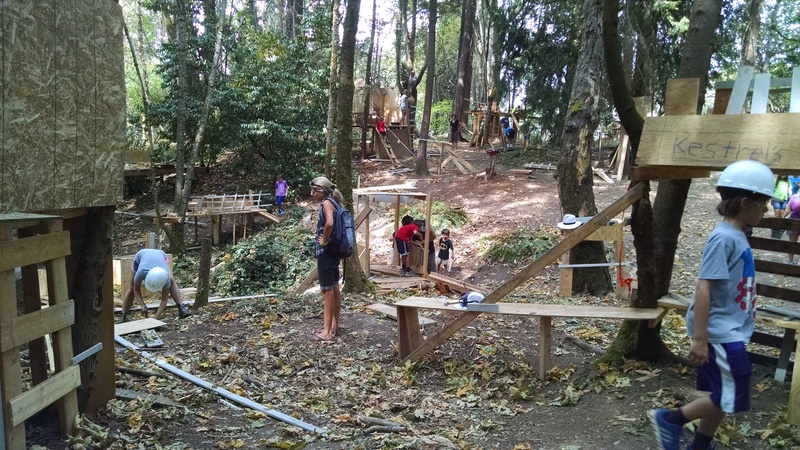 Each day the park is open, new structures pop up simply by adding, removing or connecting to the existing forts, bridges, ladders, ramps and swings. 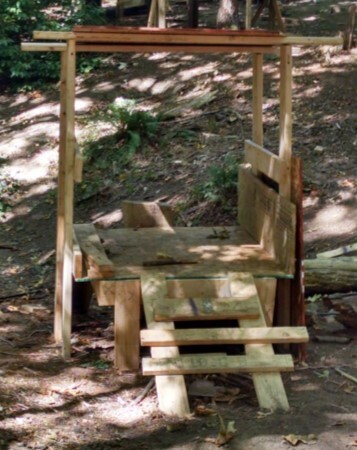 This is a land where children build their own playground! 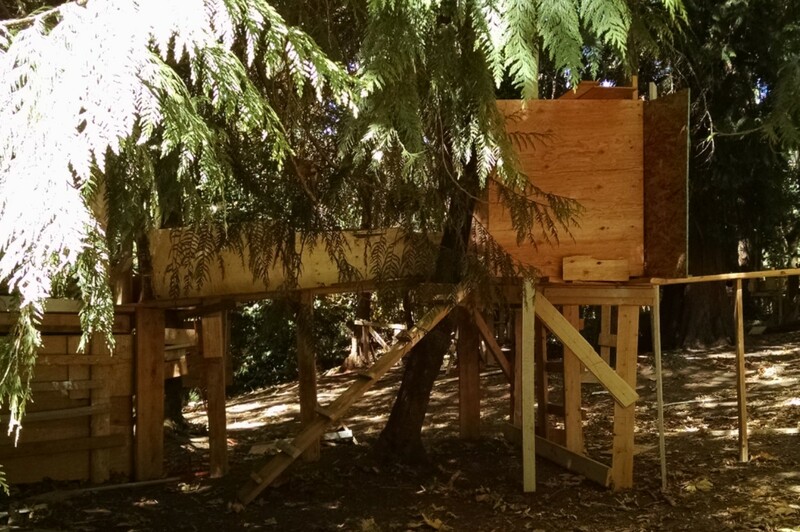 They build tree forts, add makeshift slides and swings, and add in fun imaginative details like mailboxes and chairs. 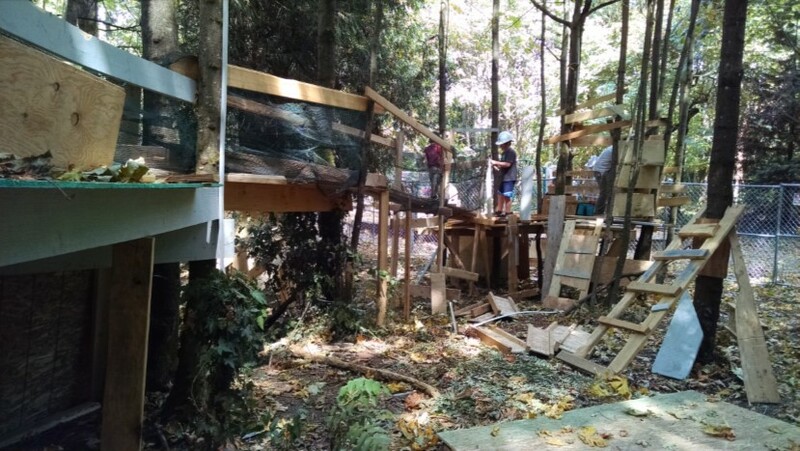 When they tire of building, they explore other structures, climbing up high on rickety bridges, ducking low into hideouts, and clambering across the hillside. It’s very fun!!! 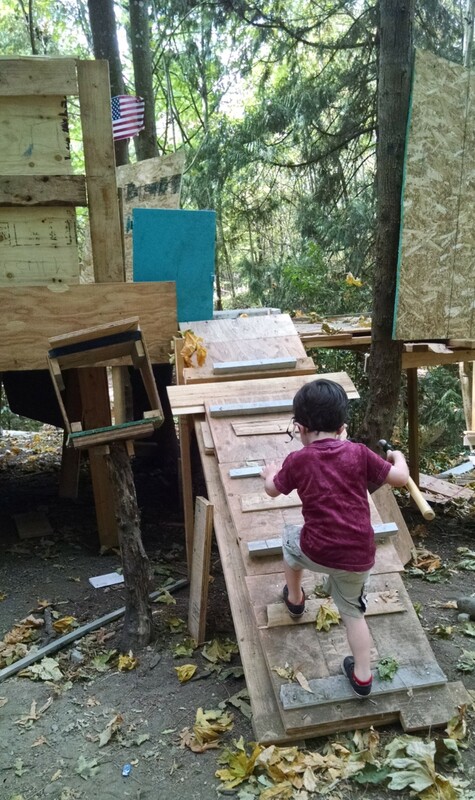 There are lots of things I LOVE about the Adventure Playground, which I’ll share below. But, there are some definite safety risks there, and it’s not for a parent who is faint of heart. And it’s NOT appropriate for kids under 4. Be sure to read the cautions below. This Tuesday and Wednesday (Aug 30 & 31), they’re open 1 – 4 pm. Then they’re open on Sundays 9/11, 9/18, and 9/25 from 1 – 4 pm. Admission is free, but please donate! 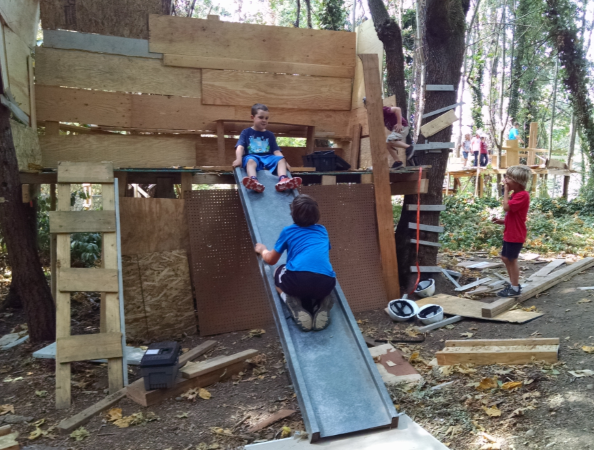 (JayMarc Homes is sponsoring the playground this year, but support from participants is important to showing Mercer Island parks that we appreciate this opportunity!) It can be closed for inclement weather. It’s ESSENTIAL to wear good, solid, closed toe shoes with sturdy soles!! 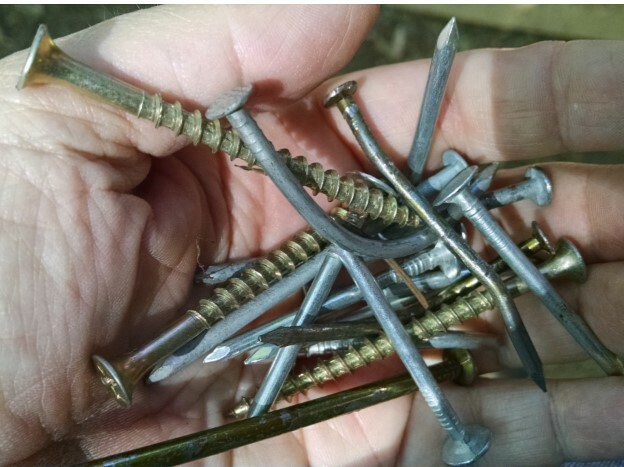 There are nails and other hazards everywhere you step. It would be best to wear long pants, probably – we were there on a high 80’s day but it’s very wooded, so it doesn’t get very hot. Bringing a water bottle would also be a good idea and many parents bring snacks. When you arrive, the parent must sign a waiver. You’re given a copy of the rules: basically keep track of your tools, respect others, do not take down existing structures, be safe, and report injuries or emergencies. Kids 12 and under must be accompanied by an adult. Then they check out a toolbox to your child. 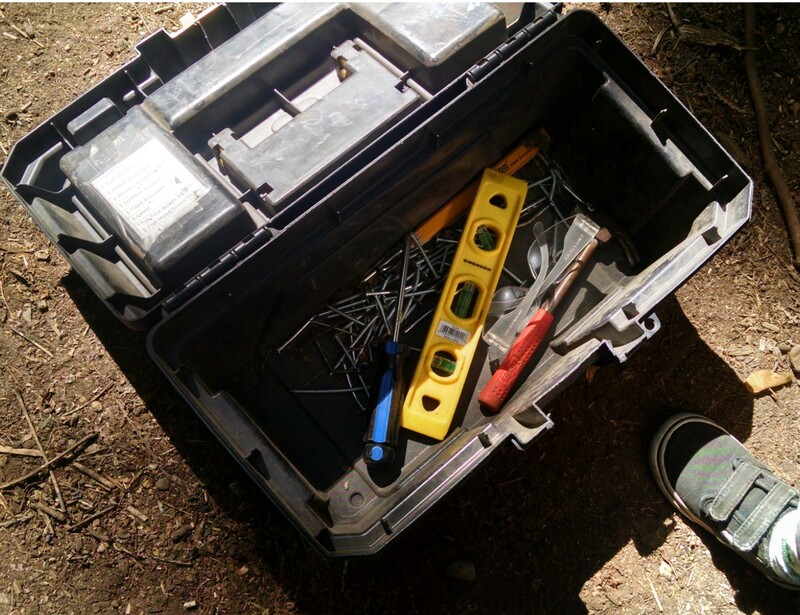 It contains items like a kid size hammer, a screwdriver, a level, safety glasses, nails, screws, a big pencil. and a measuring tape. Some might have a saw. You can also pick up a construction helmet. 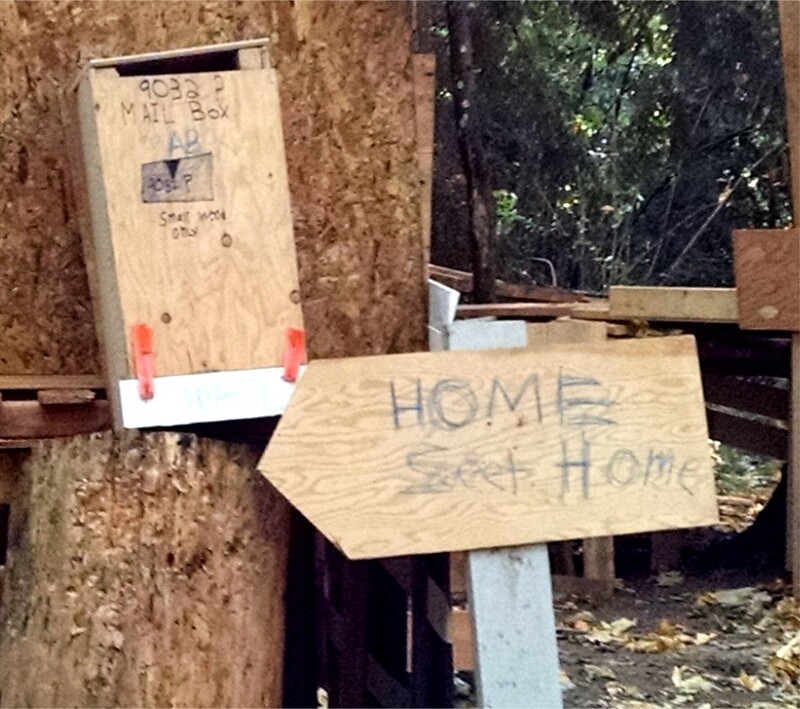 Wood scraps are scattered everywhere on the ground – you scavenge around for what you need. Occasionally there are specialty items: deck railings, bed frames, playground slides. When I went in 2015, I wished there were rope, because it really increases the building possibilities. In 2016, we found some ropes we were able to use to make a swing. In the future, I plan to bring an adult size hammer – sometimes we needed more leverage to pound or pull a nail than you can get with a kid size hammer. We could have also used a pocket knife to cut a rope with. 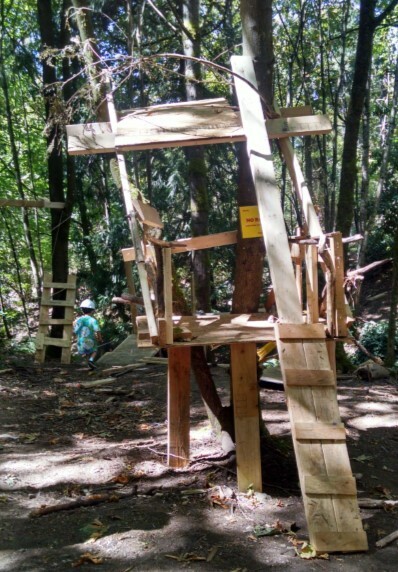 The playground opened July 5th, so at this point in the season, you’ll find lots of established structures that have been built by the kids who came before you. The photos below are from 2015 and 2016. Click on any photo for a larger view. Some are a little more rickety and haphazard. Like the Facebook page for Play Free Movie. They post links to new resources on these topics. There is so much to be learned in this environment!! Creativity. As a child plays and explores what is already there, they learn about the range of possibilities, and start creating their own vision of what they would like to see in this world, and then set about making that vision a reality. Construction skills. Kids learn about hammers, nails, saws. They learn about measuring, rope tying, adding in shims to stabilize something. So many skills that they discover the need for in the moment of building. Safety assessment. 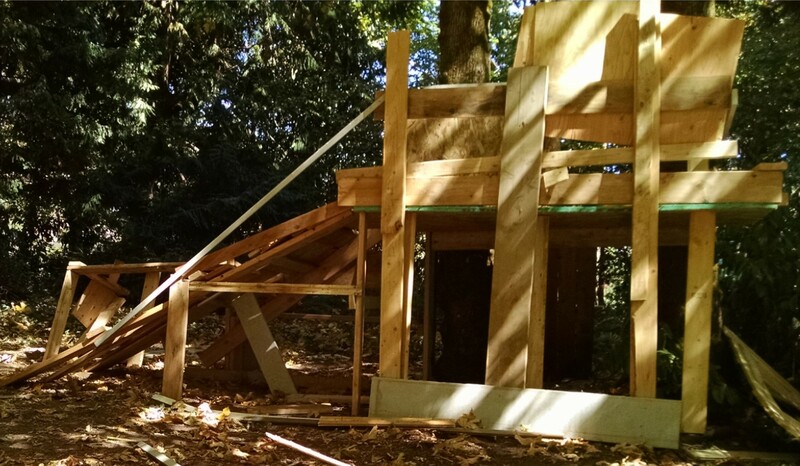 They learn to test their work to see if it’s stable and safe, and re-build as needed. Failure and trying again in a new way. Not everything they attempt works! I was watching a mom and daughter try to fit a bed railing in between two existing uprights. It kept tipping backwards, so they added support boards behind it. 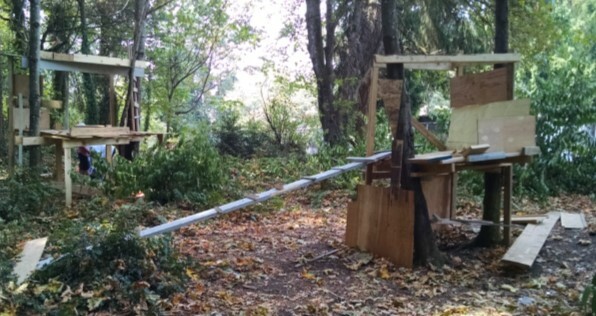 But then it was tipping forwards, so they added more boards, and it still tipped, so they had to figure out how to build a better stabilizer to hold it in place. Teamwork. When installing an 8 foot long plank on a 4 foot tall platform, you need help. You can’t do it alone. So, you ask for help, you explain what you’re trying to do. You work together with someone. If they have different ideas, you might need to learn some conflict resolution skills. Satisfaction in a job well done. The kids had just even more fun playing here than they would in any regular playground, but beyond that, they had a whole other layer of pride, sense of competence, and boosted confidence. They all left the playground bragging about what they had created together. Read more about what kids learn here, where I share more photos, and stories from our trip. There are definite safety issues. Many of the ramps are shaky, there are lots of high platforms without rails, and narrow wobbly bridges several feet in the air. There’s lots of potential for falls. 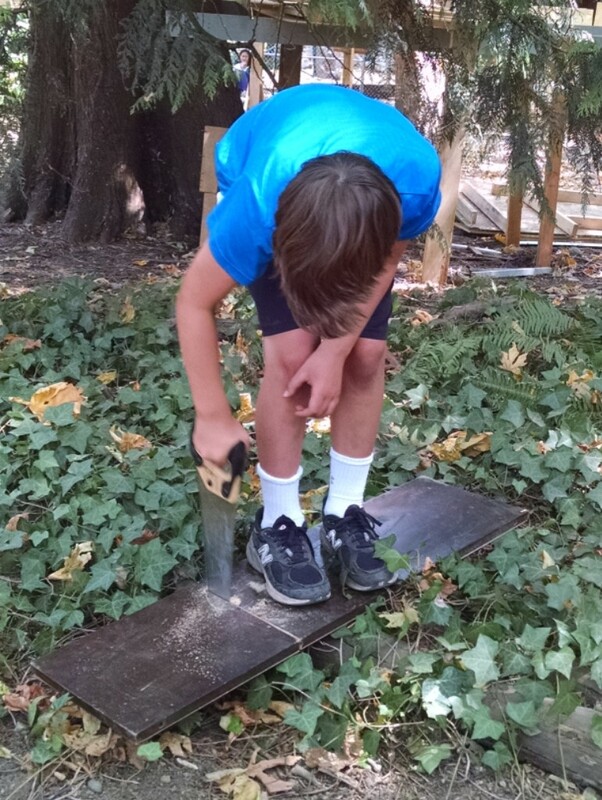 Also, the kids are working with hammers, nails, and saws. Some have clearly gotten safety coaching. Others have clearly not. There were also LOTS of loose nails on the ground. 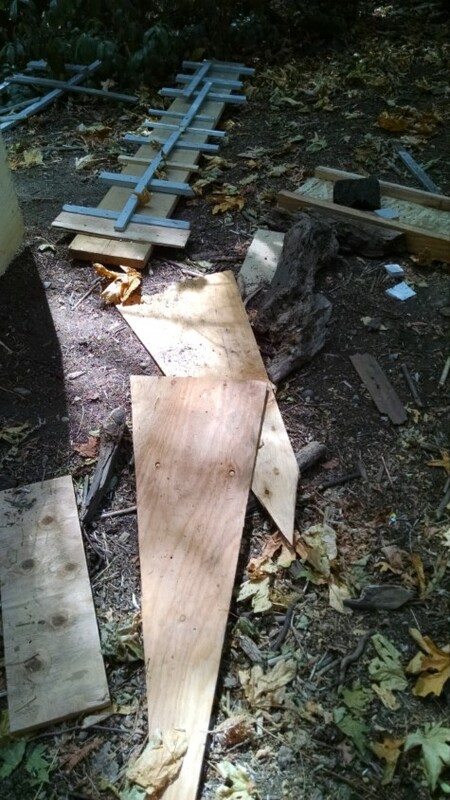 This is what I picked up just from under the platform where we built our handrail and swing. 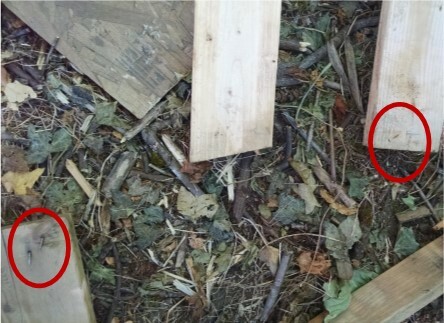 Another issue is that there’s LOTS of places where kids pounded a 3 – 4 inch nail through a 1 – 2 inch thick board, and that means there’s a section of nail sticking out on the other side… so watch out for protruding nails on the backs of ladders and on the bottoms of platforms. I believe kids can stay safe there, but only if you emphasize to your child the importance of caution. An article in Seattle’s Child says that there have been few injuries, and most of those have been adults, because the kids are being more cautious. I certainly taught my child how to be careful there! I let him explore, but I made sure he knew to watch the ground when he walked (no running), test to be sure something is stable before going on it, check to be sure there’s no nails poking out before you put your hand there, and so on. I LOVE the free play aspect of this playground, but I also think that with great freedom should come great responsibility. I wish that all parents would give their kids some basic education on the way in, not just about how to move safely through the playground and how to use tools safely, but how to be responsible for keeping it safe for others. I wish they were taught to be sure their structures were as stable as possible before walking away and leaving them for other kids to play on. 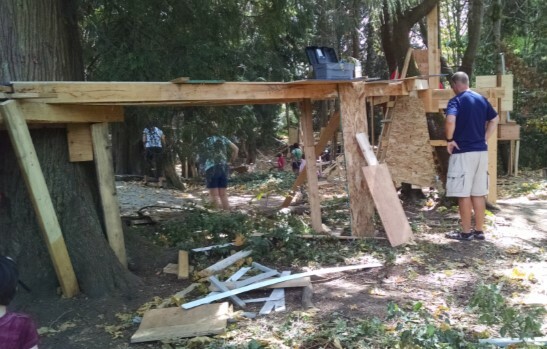 I wish kids were encouraged to stack all their scrap wood in tidy piles, near worksites, but not directly in the range or where someone could fall. I wish they were encouraged to pick up any nails they drop, and to also scan their worksite for any hazards before leaving for the day. I wish that when kids or parents noticed nails sticking out on the back of a handrail, they take out their hammer and quickly pound it down to keep others safe. I took my son last year when he was four. (And I should note, we spend LOTS of time at playgrounds and hiking outdoors and climbing rocks and climbing trees, so he has a lot of physical skills and learned caution from those environments.) 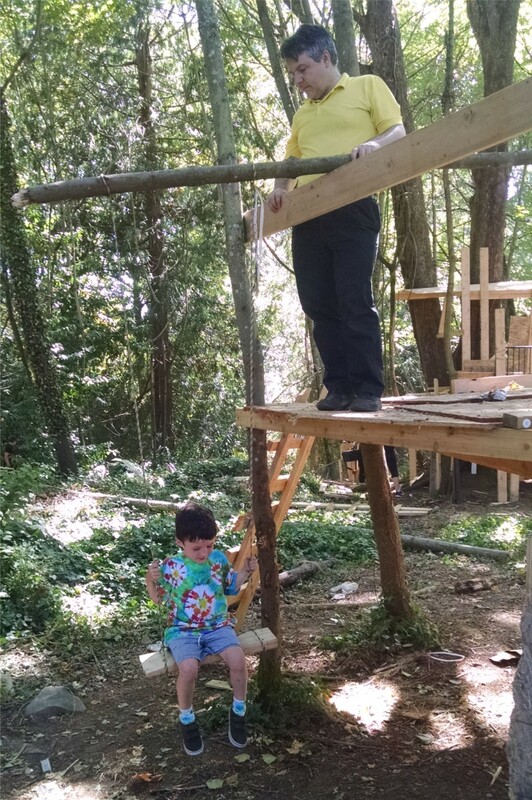 I kept a very close eye on him the whole time as he played, and actively educated him about how to stay safe and we didn’t attempt to build anything because I didn’t want to get distracted. We did carry a hammer around with us, and did pound in some loose nails we found. This year, he’s five, and my husband came too, so we had two sets of eyes to make sure he was safe. 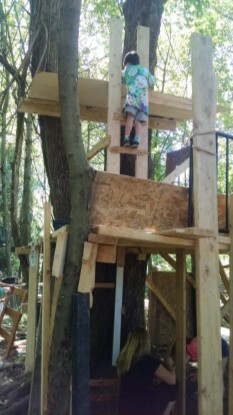 So, this year we were able to balance building and supervising him. But I didn’t really have any “sit down and relax” time. We observed other parents and grandparents with a range of ages, and definitely the 6 – 9 year olds had an adult working closely with them. For the 10-12 year olds, a few parents would sit on a log and read while keeping a vague eye on the kids and calling out suggestions. There weren’t any kids there alone that I noticed, but 12 and ups are allowed to be there without an adult. If you’d like a building adventure, check it out soon! They’ll dismantle this year’s constructions on September 25th. 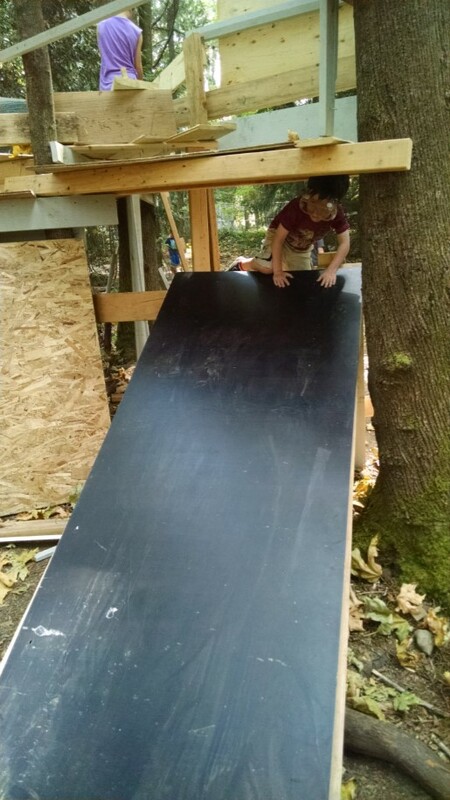 This entry was posted in Eastside Parks, Seattle area, STEM activities and tagged adventure playground, free play, mercer island on August 28, 2016 by Janelle Durham.